Me? You mean me? I'm Henry and I have a lab sister named Lark! I am 4 months old right now, she is almost 6 years old. Then there's Mommy and Daddy but no one else lives with us. I've never heard of an elf! What is an elf? I'm sure, whether you're human or beast, that you will be my new best friend- everyone else is! I like all flavors of everything! I'm not old enough to know what everything tastes like so I pretty much taste everything. Mom says I don't need to taste all the leaves and sticks and stuff I find outside but they smell good to me! Lark's ears are fun to bite on, too, but Mom says I should stop doing that also. We play tug and keep away and I've been chewing on things to help my teeth change from baby teeth to grown up teeth. Thank you, Elf! I don't know where amazonland is but it must be a wonderful place! Sorry I haven't written back sooner. We went to see my human sisters and some little kids who call my Mom Grandmommy and we were gone for a while. Now I am getting ready for whatever happens next. You asked if I like to fetch or play in the water. I think I probably do since I like to do everything but Mom says I get distracted easily and go from one activity to another. It was too cold to go in the water at the beach last week. We had some snow and sleet a while ago and I liked being in the snow. I think Amazonland sounds terrific! My sister has shown me how much fun it is to tear up boxes and she says we're in training. I'm not sure what we're in training for, but I'm getting very good at it anyway. Thanks for writing to me! It was my first e-mail ever! Henry, How are you doing? Gearing up for Christmas? Have you reviewed your gifts yet? I put them in a BBT (big brown truck) because I was pretty overwhelmed as of late. They went out on Id say the 4th, so if you have not received yet give me a quick growl and ill make some magic happen. I hope you guys are all well, and look forward to hearing from you. My Mom says you tricked her with the Amazonland box because she says she gets a lot of boxes from there and didn’t notice that it was addressed differently than usual. So yes, Mom thinks my box is here! I just have to wait until Dad gets home tonight so Larky and I can open our surprises! Mom says she’s sorry for not looking more carefully! So sorry for the mix-up Henry, I looked at the cameras from the BBT, (really google earth) and it looks like your sister was on the porch when it was delivered!!! Maybe she got her paws on it. hehe. Tell your mom, the package was addressed to her, and Elf_BEERY was the shipper. Hi Amazon Elf! It's me, Henry! Shelby and Luna are the best pickers! Larky and I got to open our boxes last night. I needed a little help to get started but I soon figured out what to do. Lark has gotten Secret Santa boxes before so she helped me start my box. Fortunately, according to Mommy, she stepped in before we got too far because you sent us the best picture of me and Lark. It is now on our mantle and Mommy says it has to stay there. When you see what the boxes and wrapping paper look like now, you will know why! 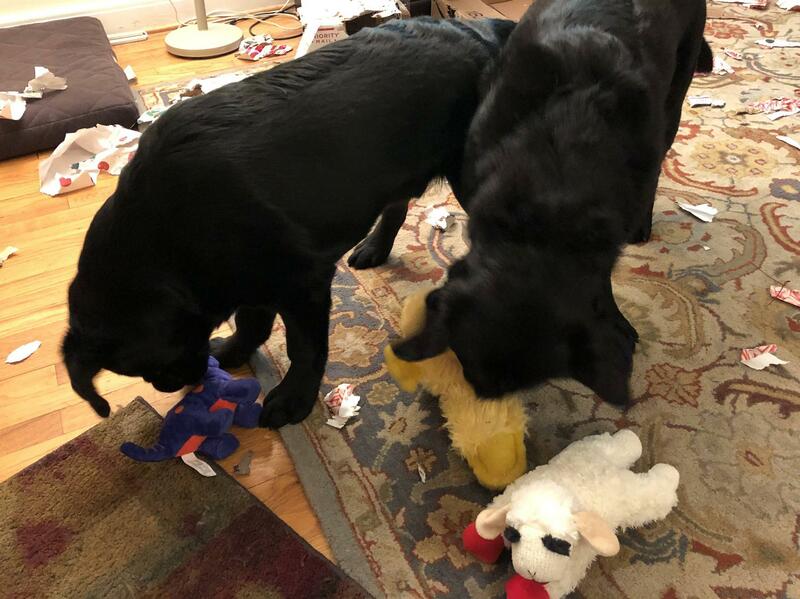 I love, love, love my Lamb Chop and big yellow duckie! Lark wanted to chew my bone but we were able to come to an agreement on that. She told me I have to share my toys because she has been sharing hers with me. 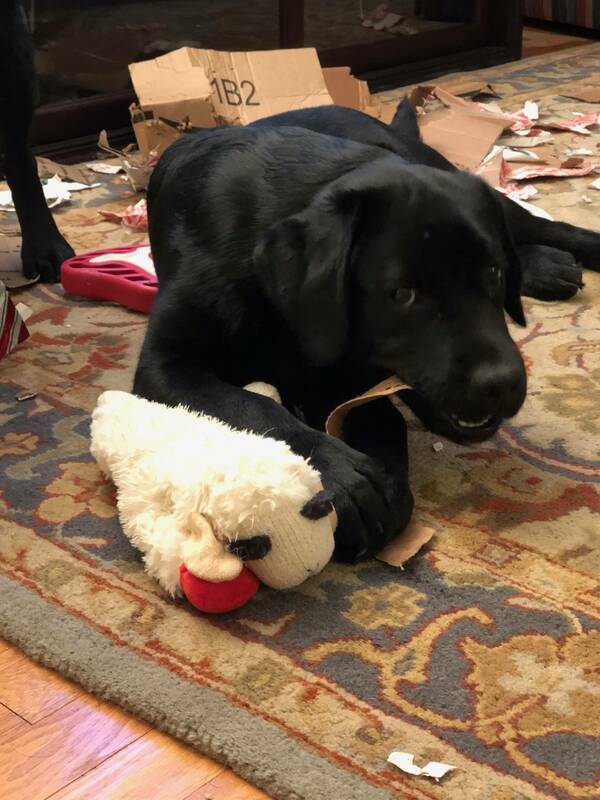 I am big enough now that I can take toys away from Lark like she has been taking them away from me and I am going to chew on my bone some more after I finish this note. After we opened our boxes, we tore them up. Lark says that's part of the game and I say, Let's Play! Thank you for the secret picture of Amazonland. We would love to run around in there! Does Luna get to run there? Mommy says I have to wait until Christmas Eve for the last present, so we will wait! Thank you so much for my first Secret Santa surprise, it was so much fun! Mommy showed me a picture of Luna and she looks smart and pretty, in that order. I hope Luna and you all have a wonderful Christmas! Mommy is going to put a few pictures here for you to see! P.S. Luna, this is what you're supposed to do with boxes. And this is why Mommy won't let me have my picture!